Victim organisations that lacked anti-fraud controls, like a Whistleblowing Hotline suffered greater losses – in fact twice as MUCH!!! A typical organisation loses 5% of annual revenues to fraud. As tips are the most common detection method, it is helpful to know who is likely to report fraud. Employees, who provided 51.5% of tips, are generally the focus of reporting mechanisms at most organisations. 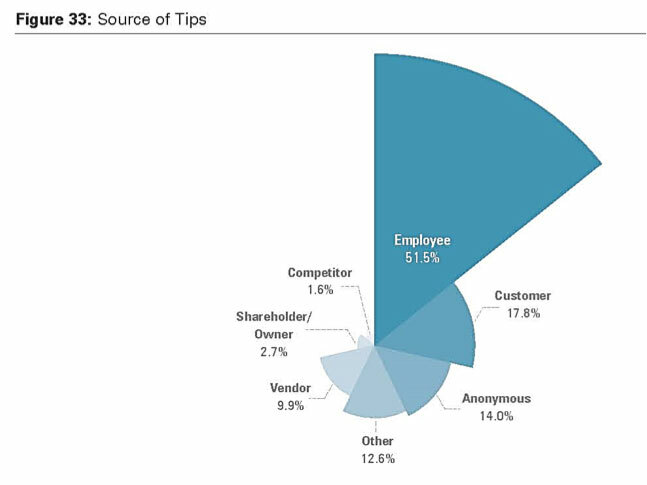 However, anti-fraud professionals should remember that more than 40% of all tips came from non-employees. Additionally, 14% of tips came from anonymous sources. 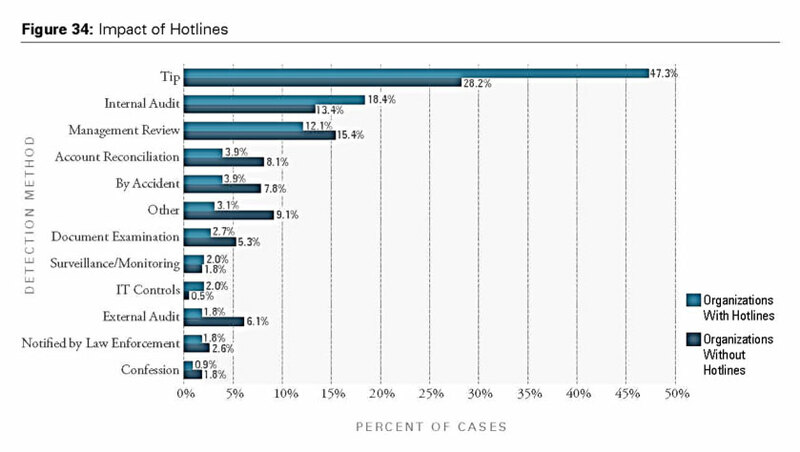 One way to determine the effectiveness of reporting hotlines is to compare the percentage of cases that were initially detected via tips in organisations with and without hotlines. The study showed that while tips were the most common detection method regardless of whether a hotline was in place, schemes were detected by tips in 47.3% of cases at organisations that had hotlines, but in only 28.2% of cases at organisations without them. Our data shows that detection methods varied substantially between small organisations (i.e. those with fewer than 100 employees) and larger organisations. 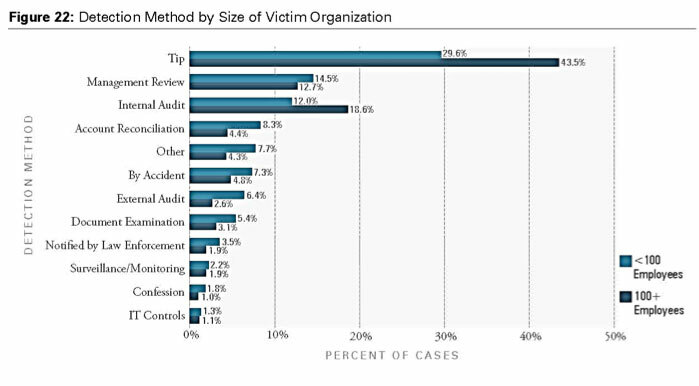 The starkest variation occurred with tips; small and larger organisations detected fraud via tips in 29.6% and 43.5% of cases, respectively. Similarly, internal audit was the detection method for 12% of cases at small organisations but 18.6% at larger organisations. One possible explanation for these disparities is that the controls and procedures an organisation has in place affect how fraud schemes are caught. The study showed that most small organisations do not have a reporting hotline (25.7%), while the majority of larger organisations do (74.1%). Internal audit departments are also less likely to exist at smaller organisations than at larger ones (38.6% and 88.3%, respectively). The general implementation rates of anti-fraud controls have remained notably consistent throughout the studies, although we have seen a slight uptick in the prevalence of each control over the last six years. The most notable changes have been in the implementation rates of hotlines and fraud training for employees, which have increased approximately 9% and 8%, respectively, since 2010. Whistle Blowers – Promoting Ethics and Honesty in organisations globally.